The Natural Capital - find us now at TheNaturalCapital.com: Welcome to The Natural Capital! Welcome to The Natural Capital! The Natural Capital is a celebration of the wealth of nature right here under our noses in the Nation's Capital. We aim to open your eyes to the amazing plants, animals, and scenery in our region – much of it accessible by public transportation. Natural Capital is also a concept in environmental economics: the concept that the ecosystem that sustains and surrounds us has inherent, but tragically overlooked, value. We need trees, for example, because they provide clean air and clean water. They are also beautiful, and the beauty of nature has value as well. Which brings us back to the purpose of this blog: getting outside to enjoy it all. Mondays: a calendar of hiking and other naturalist activities in the coming week offered by organizations such as the Sierra Club, the Audubon Naturalist Society, and several others. Tuesdays: a post highlighting a specific resource that might be helpful to you as you get outside in DC. Thursdays: an item of the week to look for while you're out over the weekend…a flower that's blooming, a bird just back from migration, or other natural phenomena. On no particular schedule, we will give you musings on miscellaneous outdoorsy topics, updates on local environmental issues, or other things that interest us. Elizabeth Hargrave spends half her week working as a health policy researcher. That leaves the other half free for hiking, gardening, and boning up on natural history. 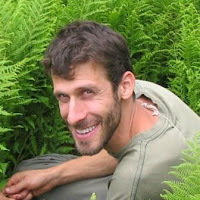 Matt Cohen is founder of the eco-landscaping business Matt's Habitats, and a naturalist who leads hikes for several organizations in the DC metro area. He also serves on the board of the Maryland Native Plant Society. We've been exploring the outdoors together since 2000, and hope to bring you a glimpse of all the wonderful things we've found in the DC area. Comments? Questions? Ideas for future posts? Contact us at thenaturalcapital@gmail.com.